The incredible features of both the Ritter 354 Spotlight and the Ritter 355 Minor Surgery Light can now be realized in a single product. It offers a unique solution for practioners who performs multiple procedures. 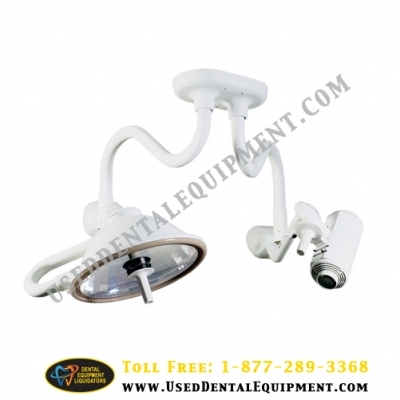 The Midmark 355 Minor Surgery Light is the perfect balance between quality and affordability. It’s counterbalanced to provide precise positioning without drifting. Less than 2½ pounds of force easily maneuvers the light to the desired position. Other features include a large pattern size with an even distribution of light throughout, unsurpassed shadow control and superior footcandle illumination. The Midmark 354 Minor Surgery Spotlight has everything healthcare professionals need…but without the heat. It’s an ideal task light for all medical environments where illumination is required for external examinations and procedures. And, with its pure, crisp and defined light pattern, it can be adjusted to suit each physician’s individual needs.